In the history of Country-Blues music there has never been a woman, alone with her guitar, to accomplish what Rattlesnake Annie has done with her art. She has spanned the globe fusing her music with ethnic music of the world, singing and recording in many languages. Rattlesnake Annie was born of Scotch-Irish and Cherokee Indian heritage on a cotton and tobacco farm in Paris, Tennessee near the Kentucky border, halfway between Memphis and Nashville, at the crossroads of Blues, Jazz, Country and Bluegrass. As an infant she was carried in a washtub to the fields among the black and white, local and migrant workers. She listened and watched as they entertained themselves with field calls, blues, spirituals and humorous stories, and as a young child she worked in the fields with them seeing birth, death, despair and happiness. She wrote her own songs and became a gifted guitarist by age 10. By the time she was 12, Rattlesnake had formed a singing trio with her cousins, The Gallimore Sisters. They earned their first money ($6.00) playing a political rally for Governor Frank Clement of Tennessee. They played local churches, funerals, weddings, prisons and hayrides for free. During this time, Rattlesnake attained the trio’s own radio show on WTPR in Paris, Tennessee, sponsored by Martha White Flour. The Gallimore Sisters also won a statewide contest where they were invited to the Grand Ole Opry stage with Mother Maybelle Carter, Roy Acuff, Hank Snow, Bill Monroe and Flatt & Scruggs. At 16, Rattlesnake was lured to Memphis, Tennessee, by the blues and rock sounds being created there and spent several formative years on the world famous Beale Street. She sang, played the guitar and was mentored by such legends as Ligtnin’ Hopkins, Memphis Minnie, Furry Lewis and Muddy Waters. 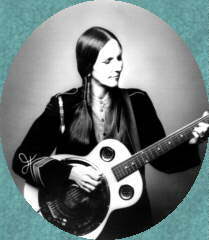 In the 1960’s, Rattlesnake moved to Texas where she began her friendship and musical collaborations with Willie Nelson. Rattlesnake continued to tour, write songs and produce her own recordings, one of which was her highly acclaimed Columbia-Nashville album, Rattlesnake Annie that resulted in three Billboard charted singles. Riding on her success, Rattlesnake was invited to Europe and Asia and became an icon for southern American music. “Braided by ringing purity, her music restores a faith in the timeless strength and quality of American folk music,” wrote Gavin Martin in England’s New Musical Express magazine. In 1991, Rattlesnake became the first American recording artist to be produced in-house by Sony-Tokyo, and that has resulted in a continuing relationship with the release of multiple albums and concert tours. She has collaborated with some of Japan’s greatest artists including Kato Tokiko, Minami Kostetsu and Kosaka Kazuya. Rattlesnake has lived for 18 years in southern Spain, the heart of the Andalusian Gypsy Flamenco music culture. There she has honed her skills as a Flamenco guitarist, singer and recording artist. “She has truth in the voice,” wrote renowned music journalist Angel Alvares Caballero for Caprensa - Spain. “A wandering gypsy musician in the truest sense…a voice with the pathos of the Blues,” wrote Paolu Caru for the Italian magazine El Ultimo Buscandero. This woman of the southern culture is truly an international ambassador of Country-Blues music. Single-handedly, she and her guitar are teaching people around the world about Southern roots music – and her audiences are truly fascinated by her. © 1998 - 2020 Rattlesnake Records.